Figure 1. 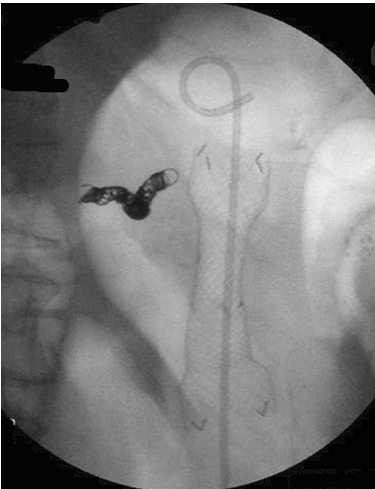 Fluoroscopic image of the fully covered self expandable metallic stent placed across the cystgastrostomy. A double pigtail stent is seen within the metallic stent. Splenic artery embolization coil is seen to the left of the stent. Wide bore fully covered metallic stents can be safely used for drainage of pancreatic fluid collections which contain a large volume of solid debris.